Activist Art: Whatever happened to the social class? In a free, public event Fred Lonidier will discuss the effectiveness and problematics of activist art in the U.S. Comparisons will be attempted with other approaches and constituencies using examples from both his labor and nonlabor artworks. Lonidier came to the MFA program at UC San Diego with a degree in sociology. 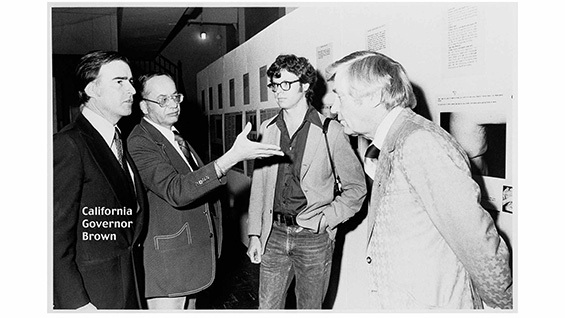 This was possible because Visual Arts was likely the first Conceptual Art department as such and interdisciplinary in approach. This last movement, perhaps of Modernism, opened the way for a host of new practices and purposes in “high art” such as photography, video, installation art and performance for the former and gender, “race,” and class for the latter. He was one of the antiwar activists who moved decisively left exploring social class and socialism from his SDS days. After getting an MFA in photography, he was hired at UCSD and later became tenured; he retired last March. Early on, he joined the University Council/AFT Local 2034, became a Labor Council Delegate and later President of the local. The Whitney Biennial 2014 will show two works of his across a more than 40 year period with “The Health & Safety Game” downtown at Maxwell Graham Fine Art. After exploring a number of socially critical issues, he launched a lifetime effort at documentary photo/text installation art “for, by and about labor struggles” or, really, class war. During those decades, He produced a number of such works and exhibited them in both the art field as well as union and community spaces. Some of his art shows were international. He also produces on Public Access, Labor Link TV, published some accounts of his practice and received numerous reviews and citations. A major shift in his work began in the mid 1990s when he took his camera 30 miles south to maquiladora labor rights struggles in Tijuana. This began a large and growing series of works, "N.A.F.T.A. (Not A Fair Trade for All)..."